Action: Semi auto single action only. Ammunition Capacity: 14+1 round magazine. Trigger Pull: The trigger pull on the Retay Baron HK is about light to medium with a fairly short pull. The actual real steel Sig Sauer P228 would have both single and double action but many semi auto guns shoot in single or double action only. Build Quality: The build quality is similar to that of my EKOL blank guns which makes sense since they are both Turkish made guns. The Retay Baron HK is well built and uses good quality materials with pretty decent fit and finish, this gun is almost all metal and has good heft to it weighing in at 2.3 pounds. The matte black finish on this gun is pretty close to what you would find on a blued gun but with less shine to it, keep in mind we will be selling the Baron HK's in Matte Black and Satin. The Retay Baron HK performed very well for me and had no problems with loading, firing and ejecting rounds when I tested it. Realism: The Retay Baron HK Sig Sauer P228 copy is a really good Sig Sauer P228 replica. 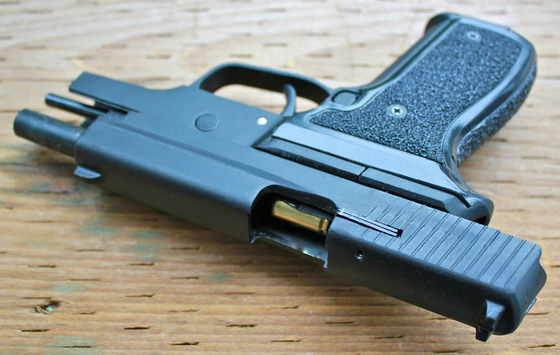 The grips could even almost be swapped with a real Sig Sauer P228 grip if the screw holes where just a bit closer to the center of the hand grip. 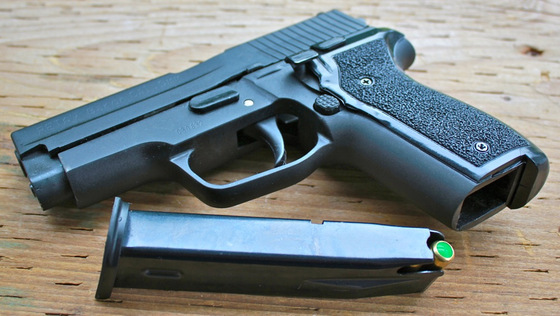 The basic gun shape and main features are almost dead on to the real Sig Sauer P228 including the de-cocker, slide catch and take down leaver. Internally the gun does differ as the Baron HK has a single action only trigger and a fixed barrel. Good hefty 2.3 pound weight. Matte black finish looks close to blued finish, satin finish also available. 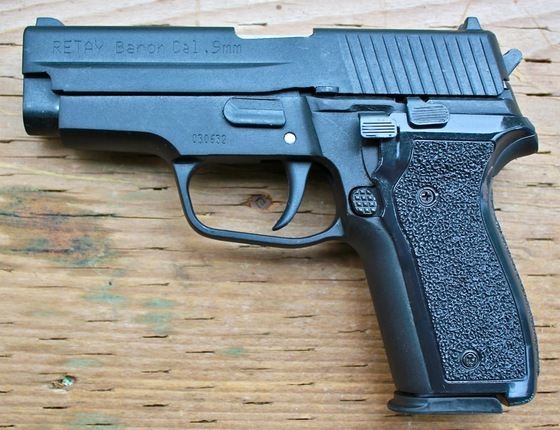 Good replica of the Sig Sauer P228 semi auto pistol. 14+1 round double stack magazine similar to real steel version. Barrel back pressure screw needs to be removed in order to use flare adaptor. Grips are a bit shiny and the texture takes some getting used to. This gun for me was another must have blank shooter as I already own a real steal 9mm version of this gun (My Norinco NP-34), I just really like the look of Sig Sauer semi auto pistols! I will be getting another Retay Barron HK but this time in the satin finish. Because I have the real gun version, I was able to see how really close this gun is to an actual Sig in looks weight and handling. As a training gun, this is ideal as there is much less risk when using blank guns for practicing things like holster draws or even basic gun control drills.